Launched in 1912, the TSS Earnslaw is the largest and grandest vessel ever to ply Lake Wakatipu. Today, the TSS Earnslaw is believed to be the only coal-fired passenger-carrying vessel still operating in the southern hemisphere. The TSS Earnslaw makes several trips daily across Lake Wakatipu to Walter Peak High Country Farm on the western shores. A cruise on this gracious heritage vessel is the perfect way to experience Queenstown’s magnificent alpine scenery. Upon reaching Walter Peak High Country Farm, you can disembark for an insight into New Zealand’s farming lifestyle. Join us for a farm or heritage tour. 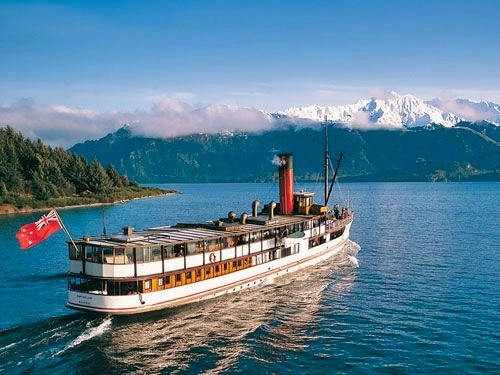 All Walter Peak excursions include a cruise on the vintage steamship TSS Earnslaw.